We run into a lot of obscure graveyards... many of them being attached to a particular institution (like the recent Sussex County Alms House cemetery) or perhaps an old family plot in a former farm turned something else (like the Willcox family plot in Watchung Reservation). But it's decidedly unusual to find a cemetery next to a memorial that has nothing to do with anyone buried there. 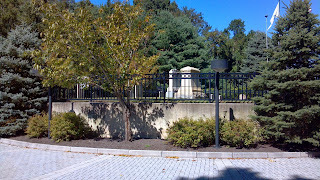 That's the case with the Crawford family cemetery located next to the New Jersey Vietnam Veterans Memorial in Holmdel. 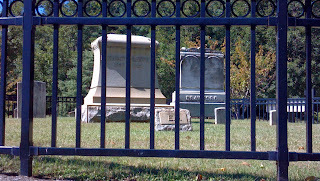 A relatively small plot of land, the graveyard is elevated and encircled by a metal fence. According to a sign on the fence, the cemetery was part of a 1219 acre lot that was originally granted to Captain John Bowne in 1687 by England's King James II. The land came into the Crawford family after Bowne's great granddaughter married William Crawford in 1756. And as many families once did, they buried their dead in a designated plot on their property, selecting a site on a gently rolling hillside. It was later described as being "one half mile east of Crawford Corners... about a half mile from the road to Everett and surrounded by woods, making it difficult to find." The tract stayed in the Crawford family until the early 1950s, when descendants sold it to the state for the construction of the Garden State Parkway and Garden State Arts Center. As a condition of the sale, the cemetery land remained in Crawford hands, sectioned off with a rusty chain link fence from an unused part of what was then Highway Authority property. Its last burial occurred in 1923, and the graveyard appeared to remain unknown to the hundreds of thousands of people who attended concerts and events at the venue every year. Things began to change in 1986, when New Jersey luminaries sought a site for the state's Vietnam Veterans Memorial. The Holmdel hillside was deemed to be the perfect location, winning over locations in Trenton and Jersey City's Liberty State Park. While the cemetery was protected via the agreement with the Crawfords, it became clear that it would need a slight makeover to befit the stature of its new neighbor. As the site was cleared for construction, the cemetery was sectioned off with a new fence and brick wall while overgrown brush was removed in favor of well-manicured grass. The cemetery now stands three or four feet higher than the walkway that leads to the Vietnam Veterans Memorial, and a sign on the fence tells the story of how the property came to the Bowne and Crawford families. Those who visit with the intent of honoring soldiers also have the chance to get an unexpected history lesson about one of the longest-lasting bloodlines in the state. If that's not hidden New Jersey, I don't know what is. 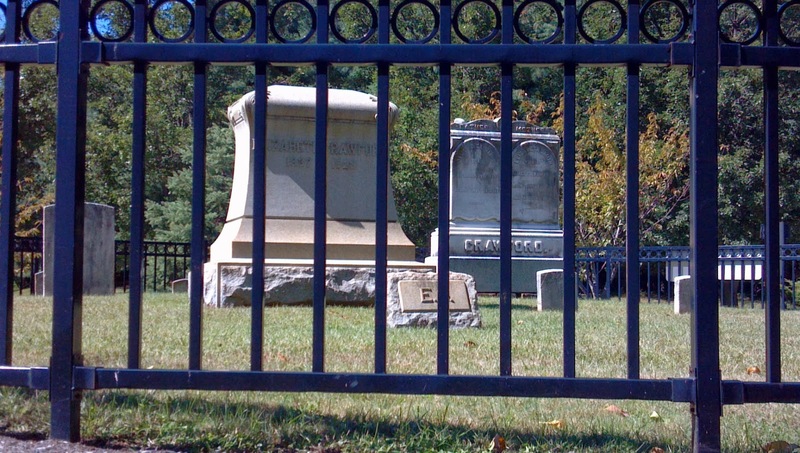 Hidden Cemeteries: Do you know about the Crabbe Family cemetery in Double Trouble State Park? It is just off the trail that leads to the lake, north of parking lot. We'll have to check that out!